The next generation Casio cash register connects to smartphones via Bluetooth®. The Casio ECR + smartphone app offers a range of features including register configuration and the ability to check sales figures. 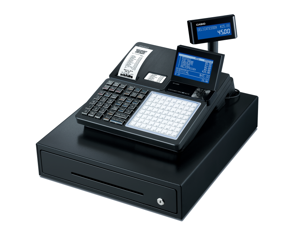 It’s an information terminal that transcends conventional cash registers to simplify operation and help your business grow. We can also programe your new Casio Cash Register SRC4500 ! If you select the programming option for this cash register, our service team will setup your Casio Cash Register SRC4500 before we ship it. at no extra cost. You can email your menu to us or we will contact you to discuss what we require to make sure your new Casio Cash Register SRC4500 is setup correctly .